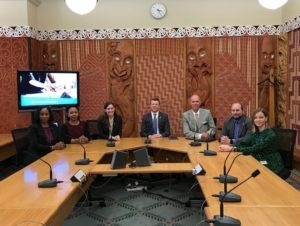 In August, ACYPL sent a delegation of seven leaders to New Zealand in conjunction with in-country program partner, the New Zealand Parliament. Visiting Auckland, Rotorua, Wellington, and Hamilton, this delegation included elected representatives from Alabama, Idaho, Massachusetts, and Nebraska, in addition to political advisors and pollsters. Among the group were three Democrats and four Republicans, representing an array of backgrounds over the group’s ten-day exchange to New Zealand. The program began in Washington, DC at the US Department of State, where delegates were briefed on the political history of the United States and New Zealand. Afterwards, the delegation enjoyed a meeting at the Embassy of New Zealand, discussing the country’s governmental system and current political issues. These briefings marked the unfolding of each participant’s journey to better understand both the New Zealand people and their fellow American delegates. Starting in Rotorua over a weekend, the delegation hit the ground running, exploring cultural sites such as the Hobbiton Movie Set and a Maori village before meeting with a local electorate office and a Rotorua Member of the New Zealand Parliament. Time in the capital of Wellington was integral to the group’s understanding of the national government; standout visits were the New Zealand Electoral Commission and observation of question time in the chambers of the Parliament. The stops in Wellington and Hamilton also incorporated meetings with organizations relevant to the delegation’s interests: highlights were discussions with the New Zealand Council of Trade Unions, a roundtable with various business groups, including the New Zealand Chamber of Commerce, and a visit to Massey University. Ending in Auckland, the delegation met with an ACYPL alumna and Member of Parliament representing the Auckland suburbs to discuss politics and culture at the local level.